and fire the wood kiln. The labour involved, and learning to understand the mystery beyond technology, in wood firing is something to master aside from working with the raw clay. Wood as fuel produces a particular aesthetic, but it is also practical given the thickly wooded and remote area where I live and work. Firings can last up to 18 hours, depending on many factors. The exhaustion I feel at the end is nothing short of satisfying. I am thankful to be strong and healthy enough to carry out this intensive activity. Candle lanterns I have made many over the years. It is recent that I have experimented with creating electrical light accents for the home, for indoor and outside. The inspiration simply comes from being involved in the design and finishing of my own home. I intend on pursuing this area of architectural ceramic art. There is something visually ethereal about the form being displayed lit from the inside. The light atmosphere in the room then becomes much of the piece. JOY. OUR NATURAL STATE OF BEING. I am illustrating in this sculpture and its title that joy is not something we must to bring in to our lives. Joy is always there, at least at the core. Sometimes in order to feel it the layers must be peeled away to get to the pure natural state, joy. I learned that from a meditation guide and I believe it is true. Some of the clay I use is mined with a shovel on Mudge Island and processed through primitive means. The image itself is archetypal. Her bear-paw hands show how she is strong and of the earth. Some aspects of being human will never change. 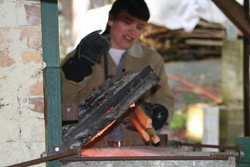 Mad Mud Slinger studio and wood kiln are both on Mudge Island. It is not accessible by ferry, however should you for some reason find yourself on Mudge Island please do contact me if you would like to view the kiln, recently fired pieces, or works in progress. Gabriola Island is very close to Mudge and a meeting/showing can be arranged there as well. The challenge of weaving clay is tedious, and rewarding. Owners of Mad Mud Slinger clay woven bowls have found a variety of uses for them. The most popular is as a fruit bowl, but I also heard of somebody who bakes bread in one! A lot of my wood fired pieces are unglazed. The reason for this is because the ashes from the burning wood deposit and melt on the clay surfaces, giving the piece a natural glaze. In other words, the kiln is self-glazing and the effect is more satisfying to me than decoration that I create with glaze recipes.